More often identified as Red Cloud’s first fire hall, this was actually the hall for the town’s Independent Order of Odd Fellows organization. It was built on the northwest corner of West Sixth Avenue and Webster Streets in the summer of 1886. One of many fraternal organizations in Red Cloud at that time, it was often abbreviated IOOF. 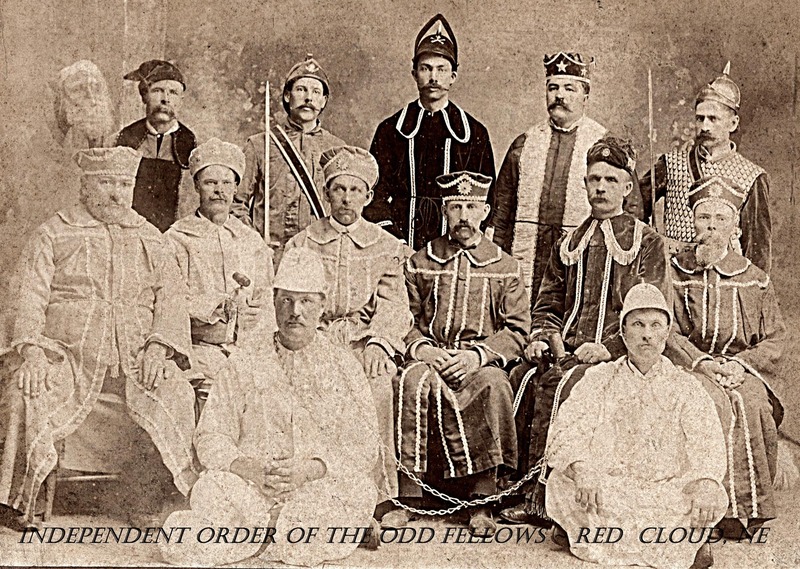 The Odd Fellows was a service fraternity whose teachings and beliefs were based on the “three link chain” principle of friendship, love, and truth. They were a viable organization with a large membership in Red Cloud for many years. Often times deceased members gravestones were engraved with symbols related to the organization. Their main objectives were based on helping those in need and becoming better individuals. They were nonsectarian and spearheaded many relief efforts. Their sister counterpart was The Rebekah Organization which was also active in Red Cloud. Although no longer active on a local basis, they continue to carry out goodwill missions on both national and international levels. Gleanings from a January 1888 issue of The Red Cloud Chief confirm that the city of Red Cloud opted to rent the first floor of the IOOF Hall for the fire department, as well as a few other rooms to be used for council chambers and the board of trade. The fire department, as well as a few other rooms to be used for councilchambers and the board of trade. The fire department then erected a fire tower and bell to the west of the building. The Odd Fellows used the second floor for the activities associated with the organization. The facility was also host to dances and other community activities. The Red Cloud Fire Department had two hose teams, Holland and Warner. 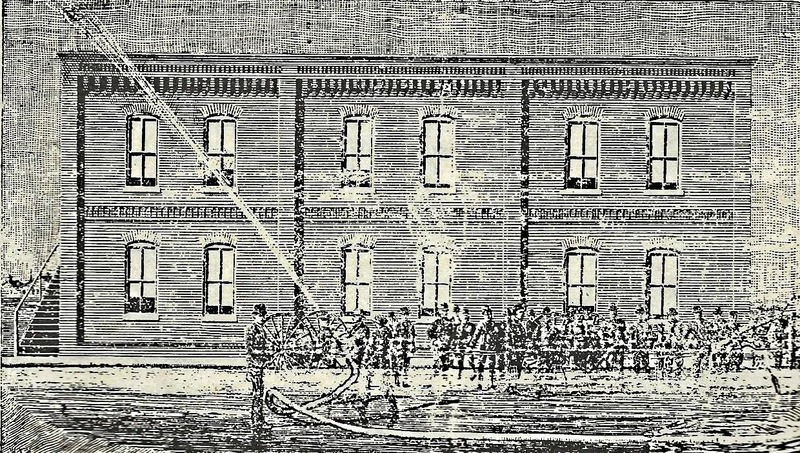 The Holland Hose Team was photographed in front of the Moon Block on July 4, 1888. One of the years that Red Cloud was host to the Nebraska State Firemen’s Tournament was 1889. 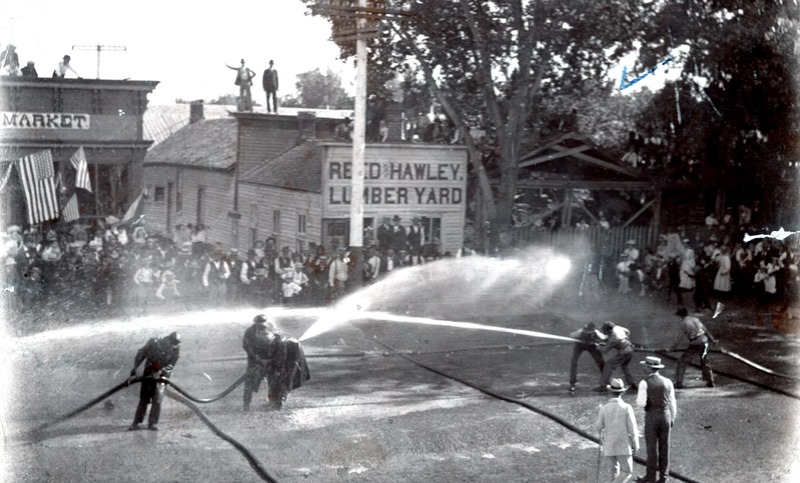 However taken at a later time, the photo shown below was taken in front of the Reed and Hawley Lumberyard in the first block of West Fourth Avenue looking south shows a water fight that would have been a part of such a tournament.